PitchBIG is exclusive networking software that provides entrepreneurs with the ability to connect with investors. As an entrepreneur, raising capital to establish or further grow your business is often challenging, but investors often find that it is just as difficult to discover innovative businesses. We simplify both the entrepreneur\’s and the investor\’s exhausting process of finding, researching and connecting with each other. Interaction and exposure in the startup world has never been so simple and effective. 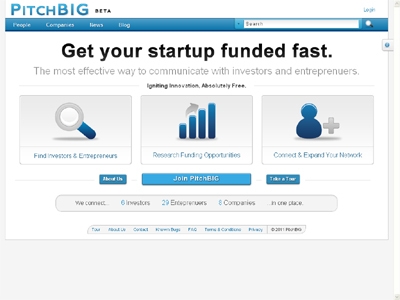 PitchBIG has been designed to make entrepreneurs and investors more successful through increased communication. There are a few competitors in our industry. Our biggest competition is AngelList because they already have an established community. FundingPost has also been around for a few years along with GoBigNetworks. We will always consider them to be a potential threat, but our strategy and content delivery drastically differentiate us. FundingPost and GoBigNetworks even charge startups to be listed on their site. PitchBIG is absolutely free.